Hot tub retailers and wet leisure specialists are being notified of dedicated Workforce Qualifications by BISHTA to help promote safe standards in and help to ensure consumer confidence ahead of the BISHTA annual conference in October. BISHTA (British and Irish Hot Tub Association), which will be hosting its annual conference on October 4 in Andover, is currently promoting a host of courses and qualifications available for dealership owners in the hot tub industry to train their staff. The courses include: Hot Tub Site Surveyor, an Electrical Awareness Workshop, Water Hygiene Management, Dangerous Goods and work is underway to bring a Certified Hot Tub Technician (CHTT) course to the UK, in partnership with APSP. In preparation for this additional training opportunity, PR and Marketing Manager Sallie Golding has revealed that BISHTA is currently working with colleagues from the Association of Pool & Spa Professionals (APSP) to develop courses in the UK, based on the CHTT syllabus. “Work is ongoing regarding ensuring the course is made specific to the UK audience, and this includes being able to cross reference not only the American standards but also BISHTA Standards and other relevant guidance in the British Isles,” reported Sallie: “It is hoped to have an update on course availability very soon. “The standards and training set by BISHTA are arguably one of the best in the world. As their strapline logo highlights, the association’s foremost focus is to ‘Promote Safe Hot Tub Standards’ providing consumers with a clear route to buy with confidence from BISHTA members. Among the many training opportunities is the ‘Hot Tub Site Surveyor’ qualification that provides recognition of customer care, health and safety information; as well as the importance of undertaking a site survey as an integral part of the process of selling hot tubs. “Following a couple of successful pilot courses, plans are currently underway to provide opportunities for more of these courses in late Autumn and early Spring,” said Sallie. Following a tremendous amount of effort by BISHTA and NICEIC a pilot Electrical Awareness Workshop course was successfully run this summer, and Sallie has revealed that due to the positive impact of the courses they are now going to also be run during the Autumn and courses will also be arranged for Spring 2017. “The course is open to BISHTA members in the first instance, and several companies have chosen to join BISHTA, as a result, to benefit from the relevant knowledge passed on at this course,” divulged Sallie. As part of its standard policy, Sallie reported that BISHTA will continue to insist that companies joining BISHTA should receive suitable water treatment advice as part of the Common Water Hygiene Management Training Syllabus and in order to respond to changes in the knowledge required, the organisation’s Technical Committee has been revising and updating the syllabus to ensure that water hygiene management courses meet the current expectations. “With a total of six tutors trained so far, expect a range of options to be available from 2017,” said Sallie. “All the above courses are primarily available to members or those companies applying for membership, except for the Water Treatment Training course which is available to members and non-members. 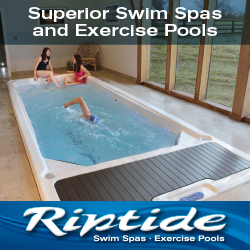 Among the advocates of enhanced water care tuition is 1 Stop Spas proprietor Chris Brady, who is currently heavily promoting the USA manufactured Vita Spa and Marquis hot tub and swim spa brands at his new Lincoln-based showroom in Billinghay and has a hot tub and swim spa installation project featured in the current issue of WhatSwimSpa? magazine. The Hot Tub Retailer magazine Talking Head has linked up with his contacts at the APSP to help introduce some of its current elements into the British market and has urged retailers to ensure new customers gain the correct water care knowledge for their hot tub and swim spas. “Retailers need to be promoting top levels of water care to their customers and following up new customer sales to ensure that this is being carried out correctly,” said Chris. “As an industry we don’t want to be hit by illnesses or death due to the neglect of water care. I believe that we should conform to better standards as a whole in this country. I’ve been linking up with the APSP in an effort to try and bring some of the positive elements into the British market that the organisation and its members have been introducing into the USA. If you are interested in becoming a member of BISHTA or would like to attend the BISHTA annual conference, please call 01264 356211 or visit BISHTA’s website for more information.